New York Fashion week marches on! 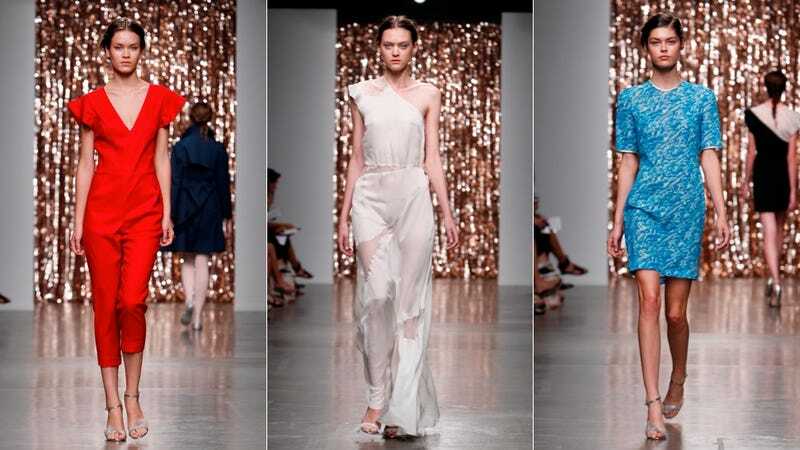 Tocca designer Emma Fletcher showed her spring/summer 2014 line yesterday, and the concept was a bit all-over-the place. Brightly colored cigarette pants, various ballet-inspired garments (occasionally paired with silver underwear, as one does), see-through floor-length gowns (with silver underwear peeking out), and a few crisp, tailored suits comprised this season's line. Tocca's SS14 collection is extremely pretty; a great deal of the beauty is in the details: lace patchwork, intricate cutouts, and jeweled embellishments. The theme of this fashion show, I have decided, is "Wearing futuristic underwear, Xenon: Girl of the 21st Century juggles her corporate career with a vibrant social life and many various hobbies in the present day."